This week I was in Mainz, Germany for the European Collaboration Summit (ECS). This was a community rather than a commercial event, the difference being that the event is run on a non-profit basis by members of the Office 365 community instead of a for-profit company. However, given that 1,600 people attended (with over 300 on the waiting list), I think ECS is in the category of a super-community event. The quality of most of the conference sessions stood up to comparison with any other event in this space, including Microsoft’s headline Ignite conference. Like any conference, some speakers were weaker than others, and some struggled to deliver sessions in English. It’s also true that some better coordination could have happened to avoid content duplication, but generally, you couldn’t complain about the content-rich nature of the sessions. Because ECS has grown out of the SharePoint community, it’s unsurprising that much of the content focuses on SharePoint. SharePoint is important to Office 365, but it’s only one of the basic workloads and there’s lots more to talk about in an Office 365 context, including Azure Active Directory and the many Azure services that surround and enhance Office 365 applications. I hope that future ECS events will embrace the opportunity to create a more holistic and expansive agenda that covers the whole of Office 365. But these are minor observations that don’t take away from an extremely well-run and enjoyable conference. Sessions ran to time, the Wi-Fi was generally very good, the audio-visual support worked very well, and the rooms were generally large enough to accommodate everyone who wanted to attend a session. The conference food disappointed some, but I thought it was well up to the expected standard (and there was plenty of it). All-in-all, if you’re based in Europe, you could do worse than plan to be at the 2019 event, which will also be held in Mainz (June 3-5). You’ll spend far less on your ticket (less than a hundred Euros), Mainz is easy to reach (25 minutes by train from Frankfurt airport), and you’ll enjoy meeting the great and the good of Office 365 at ECS. I gave two sessions at the conference. 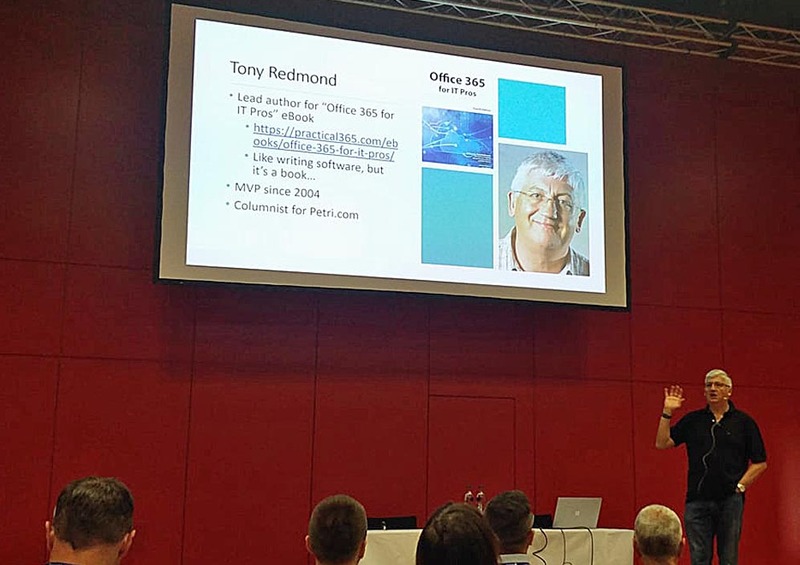 First, I spoke about the opportunities that exist after a tenant completes their initial migration to Office 365 (usually moving mailboxes) and described some of the areas that tenant administrators might want to investigate. After all, they have to do something to replace the hours previously occupied patching servers and installing hardware. Here’s a download link for the session deck. My second session explored how to use PowerShell to work with Office 365 Groups and Microsoft Teams. Given that the ECS sessions are only 55 minutes long, I guess it was inevitable that a topic like this would run long, and that’s exactly what happened. In any case, I had some fun with the audience, who tolerated my amateur attempts at coding. And here’s a link to Managing Groups and Teams with PowerShell. Like any experienced presenter, I put in some effort to make sure that all the code examples worked when executed in live time. In other words, I had a Word document full of examples that I cut and pasted into the PowerShell command window. I’m not going to publish my cheat sheet here because all the examples and much more are described in Office 365 for IT Pros and some have been used as the basis for my regular column about Office 365 on Petri.com. Go to either place to get the latest version of the code. In addition, I also moderated a panel session covering all aspects of on-premises and cloud Exchange. No one managed to stump the panelists, so that’s always a good thing… and there were many good questions asked. This entry was posted in Cloud, Office 365, Training and tagged CollabSummit, ECS, European Collaboration Summit. Bookmark the permalink.